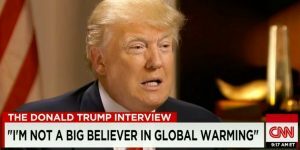 Connecting Research: The Forum · What is wrong with Donald Trump’s denial of climate change? What is wrong with Donald Trump’s denial of climate change? Later this week, a climate denier will become the President of the United States. 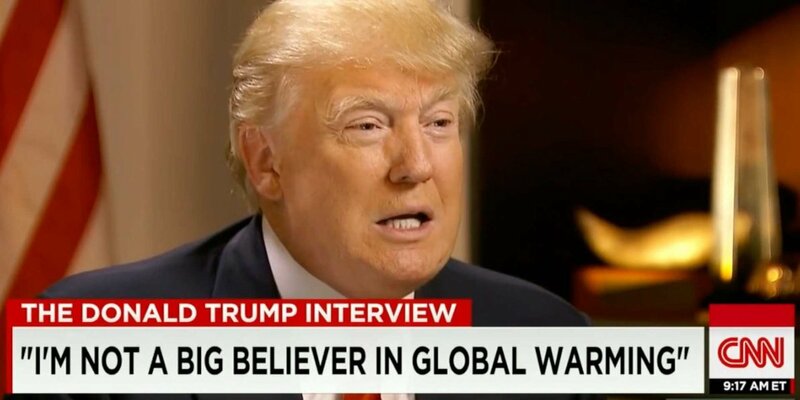 Donald Trump claims that ‘nobody really knows’ whether climate change is happening, and has asserted in the past that climate change is a hoax. To make things worse, Trump has filled his cabinet with several climate deniers, and his transition team have raised fears of a ‘witch hunt’ of climate experts in the Department for Energy. Today, a letter to the Prime Minister Theresa May, signed by leading figures in the UK climate research community – including some at the University of Reading – expressed fears about what this could do to the evidence base for global climate policy making. If the new Trump administration follows up on his campaign pledges to tear up existing US climate policies, the future could be bleak for the Paris Agreement, which may be the best and last hope for global action on climate change. Many people in the climate research community are appalled by the climate denial of Trump and his incoming cabinet. But what, exactly, is wrong with it? One thought might be that Trump’s climate denial is outrageously bad science. The essence of science is contestation and disagreement, and science in a state of health makes space for mavericks who strike out with bold new hypotheses, sometimes enabling great leaps forward. Should we be horrified by Trump’s denial because he does not fit this mould? This would be a serious mistake. The climate denial of Trump and his cabinet is not bad science: it is not science at all. Such views have grown from a set of organised, well-funded, strategic, deceptive, ideological practices undertaken by a range of conservative think tanks in the US, funded by those with fossil fuel interests, and which have perverted climate legislation in America. The tactics these deniers employ include claims of conspiracy among climate scientists, appeal to fake experts, cherry-picking data, and outright deception. So he says he doesn’t believe the experts. So what? To understand why Trump’s climate denial is so heinous we must be alive to the severity of the climate crisis and how little time is left to take meaningful action to contain it. Climate change damages human security on a global and intergenerational scale. Even if all countries achieve the emissions reductions to which they have voluntarily committed in the Paris Agreement, average global temperatures are likely to rise by between 2.7C and 3.5C by 2100. And if countries don’t meet these commitments, and instead continue to increase emissions of greenhouse gases – the ‘business as usual’ scenario – we could see truly catastrophic temperature rises in the range of 4.78C to 7.36C by 2100. And let’s be clear: average temperature rises in either of these ranges will have devastating impacts on food production and security, will increase disease, cause conflict over scarce resources, displace millions of people, and deprive them of their livelihoods and cultures. Furthermore, this damage could extend far into the future, with terrible consequences: as a recent study in Nature Climate Change put it, ‘the next few decades offer a brief window of opportunity to minimize large-scale and potentially catastrophic climate change that will extend longer than the entire history of human civilization thus far’. We have a brief and shrinking window of opportunity to avert climate catastrophe for our grandchildren and the further future. In this context, it is appropriate – required, even – to be horrified by the aggressive climate denial of Trump and his cabinet. This is far from an ordinary exercise of freedom of speech. Climate denial in the context of the climate crisis is like the famous crowded theatre case, of which Justice Holmes stated ‘[t]he most stringent protection of free speech would not protect a man falsely shouting fire in a theatre and causing a panic’. Using this model, here is how we should assess Trump’s climate denial. A fire (climate change) has started in the theatre (planet Earth), from which there are no exits. Unchecked, the fire will kill and injure many in the theatre, especially those in the cheapest seats (the global poor, and the future poor). Many people can smell the smoke, but many others have not yet noticed and are still enjoying the show. Some speakers (climate scientists) are trying to warn everyone so that the fire can be contained before it quickly spreads out of control, with dire consequences for the people waiting outside to see the next show. These warnings are measured and calm, and reflect the consensus among them on the causes, severity and likely impacts of the growing fire. Another group are sitting mainly in the most expensive seats, and have easy access to fire extinguishers (Trump and his cabinet). This group are shouting louder that there is no fire, or that it is not serious, or that there is plenty of time left to put it out. They shout a lot about how the other group are hoaxers, or lack real evidence that the fire has started, or don’t really agree that there is a fire. And they are not using the fire extinguishers, and won’t let other people get to them, because they and their friends would lose their nice seats in the theatre by having to do this. Many of the people in the theatre are either confused by these conflicting messages, or are convinced by the fire-deniers. There are enough people in this combined set to significantly slow down the efforts of those listening to the accurate warnings who are trying to put out the fire, and of those who are trying to persuade the fire-deniers to hand over the extinguishers. In this scenario those shouting ‘No fire!’ endanger all those in the auditorium, as well as the people queuing up for future shows who will be taking their seats in a burning building. Focusing on this kind of crowded theatre scenario reveals the right way to condemn the climate denial of Trump and his cabinet: as an endangerment of humanity. This post draws on Professor McKinnon’s published work, and was funded by a Leverhulme Research Fellowship (RF-2014-021). ‘Should We Tolerate Climate Denial?’, Midwest Studies in Philosophy, Vol. 40, Issue 1, pp. 205-16. ‘Endangering Humanity: An International Crime?’, Canadian Journal of Philosophy, forthcoming 2017. Sadly this article does not relate to the question asked in the title but merely restates the scenarios (higher end) that flawed inaccurate models have produced. It is emotive and uses language such as “denial” that we have moved on from in this debate, or I hope we had. As an ex alumni who worked on greenhouse gases and environmental impacts in the early 80’s at Reading I am disappointed with this quality of output. No attempt to present a cogent argued case to prove why Trump is wrong just the usual rhetoric and banal metaphors. Poor work. It deserves better debate than this banal unscientific effort which is guilty of what it accuses. I think you have misunderstood the sense of ‘wrong’ here. My question is not whether Trump is factually wrong about some details of climate science. As he has never engaged with the details of climate science, there is nothing to say here. He has made sweeping claims about the status of knowledge about climate change (it’s a hoax, nobody really knows) and these are incorrect. Given that, my question is what is *morally* wrong with Trump’s climate denial. Furthermore, I don’t rely on higher end scenarios to make the case: even if temperature rises are at the lower end under best case scenarios (e.g. 2.7C when all parties meet their Paris commitments), enormous damage will be done to present and future people. Using the theatre analogy: shouting ‘No Fire!’ when the best case is that fire is likely to burn and kill only those in the cheapest three rows is morally disgraceful. To criticise my argument you must engage with it as a series of claims about moral wrongness, but you fail to do that. Finally, reference to ‘climate denial’ is common in the climate ethics and climate justice literatures. I know that scientists don’t like that language – but scientists don’t have a monopoly on the best way to describe the human realities of climate change.